Back in the spring of 2009, the Columbus Blue Jackets took on the Detroit Red Wings in the first round of the Western Conference Quarterfinals. For many of the Blue Jackets, it was their first trip to the Stanley Cup Playoffs. One of those young players making their playoff debut was 21-year old goaltender, and Calder Trophy winner, Steve Mason. Ultimately, the inexperience showed and the Blue Jackets were swept by the Red Wings. Fast forward to Spring 2013. By this point, Mason had been relegated to backup, ironically to former Flyer Sergei Bobrovsky, and could not seem to find the same success he had back in 2009. That same year, the Flyers began to realize that the Ilya Bryzgalov experiment was not exactly a success. As their playoff hopes faded away, they traded backup goaltender Michael Leighton and a 2015 third-round pick to the Blue Jackets in exchange for Steve Mason. At first, it seemed like a backup for backup trade. However, he change in scenery helped Mason, who many thought won the starting job from Bryzgalov. Mason finished the abbreviated 2013 season with a 4-2 record and the support of the Flyers fan base. As the regular season neared its end, Mason suffered an injury in a game against the Pittsburgh Penguins. That injury kept him out of the regular season finale as well as the first three games of the series against the Rangers. After playing the last 7 minutes of Game 3’s loss in relief of Ray Emery, Mason got the start in Game 4. In was essentially a must-win game for the Flyers, Mason came up huge, making 36 saves on 37 shots to preserve the 2-1 win for the Flyers and, more importantly, tie the series at 2. 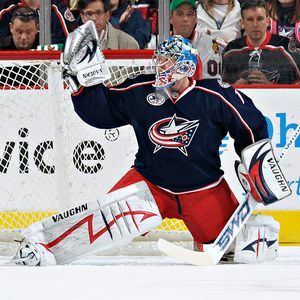 Many were unsure of how Mason would fare given his only playoff experience was in 2009 with Columbus when they were swept out of the first round. Personally, I was happy to see Mason make his return, and Flyers playoff debut. The thing is, Mason is not a 21-year old in his second season anymore. He is now 25 and has more to prove after the disappointing end of his tenure in Columbus. For some players, all it takes is a change of scenery. As the Flyers head back to Madison Square Garden, they bring with them a new confidence with the series now tied. For Steve Mason, it’s another chance to solidify himself as a starter for several years to come.